Earlier this year my daughter was talking about what we should do to celebrate our birthdays this year. She was to celebrate a big birthday and so was I. For her it was 16 which brings a whole set of expectations. For me it was 50 which has an entirely different set of feelings and meaning. We decided that one of the things we would do together was to watch the entire One Tree Hill TV show together from the pilot episode to the finale. Cecilia had discovered the show when we were living in the Middle East. Somehow this show about high school juniors in the US having parties and being pretty inappropriate made it through the filters of the middle east television guardians. Now we could add this to the instant queue on Netflix and watch it from episode 1 through 187. Every weekend and some weeknights we would watch an episode or two or three or four. Her birthday passed and we were not through the entire series. My birthday passed and we were soooo close. But then it happened. We found ourselves on episode 182 and we had to just marathon it through to the end. Over the year we spent time together laughing, crying, tweeting, and analyzing the lives of Brooke, Peyton, Lucas, Nathan, Haley, Jamie, Skillz, Mouth, Millicent, Dan, Keith, Deb, Victoria, Karen, Clay, Quinn, Lindsey, Crazy Nanny Carrie, Julian, Jimmy, Whitey, Q, Sam, Rachel, Chuck, Mia, Alex, Chase, Chris Keller, and all the other characters who lived in Tree Hill, North Carolina. And of course, there were all of those musicians that were somehow traveling through Tree Hill and played at Karen's Cafe and Tric. We marveled at the talent of Mark Schwahn and his team and reminisced about all of his cameo's over the 9 seasons. We talked about the songs, the ideas, the plot twists, the camera angles, the voice overs and we just spent time together. The writing, the editing, and the music selection always made each episode interesting. The music wasn't just inserted to make the show hip and cool but it was in there as part of the story telling. When the final episode ended we both had tears in our eyes. For me, it was a wonderful way to celebrate my Over the Hill birthday- but instead of just an over the hill it was an Over the One Tree Hill. We celebrated our momentous endeavor by watching more. We watched the special episode that played just before the finale, we watched special features and directors commentaries. By this time we had purchased a couple of the seasons on DVD so that we could watch the special features and commentary as well as watch some of our favorite episodes again. There are 187 episodes after all. Cecilia asked me if I minded watching one more special feature. I enthusiastically said "No! I don't mind at all! I'm still sort of on a high from our huge accomplishment" She thought about it for a second and said "Hey, I know what we can do. We could take a victory lap and watch it all again". We just laughed and laughed at the thought of a the victory lap. We had completed the ultimate One Tree Hill marathon and finished in style in less than a year. The next milestone birthday for Cecilia will be 21 and she may want to spend it with her friends and not with her 55 year old mother. 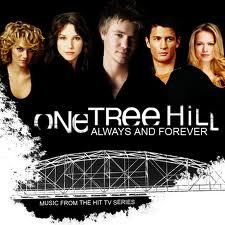 But we will always have our year with One Tree Hill and we'll always have the music. Perhaps on her 18th birthday we'll go to Wilmington NC to connect with the story and our time together. For now, just like a character from One Tree Hill, I am sitting here, over 50 - over the One Tree Hill - wondering what is next. Wait until I'm 18?? Once I get my drivers license it's a done deal.